August 1st, 1944. On the brink of adulthood, Wanda's world is fractured by warfare. After years of occupation, a chance to fight back. Her first thought: I need a gun. From the perspective of a young 17-year-old girl, Portrait of a Soldier details her experience of the largest military resistance battle of World War II, The Warsaw Uprising. Vividly revealing one girl's part in Warsaw's ferocious fight for freedom. Female forms emerge like ghosts through the rising smoke, dashing across the rubble-strewn, dismantled streets of Warsaw, chased by gunfire and shrapnel from nearby explosions in a death-defying race to deliver messages between different units of the resistance. This is how the career of Wanda Traczyk-Stawska begins, transformed from the fastest runner in her school football team to sprinting informant, to later become a decorated soldier for bravery during the 63-day battle for liberty. "What would you like to know first?" The voice of Wanda takes us through her incredible experience on the front line during the Warsaw Uprising of 1944, weaving a strikingly evocative picture of the unrelenting valour of her fellow soldiers fighting in resistance to the German invasion. Connecting together a wealth of rarely seen archival footage and images, vividly captured during the uprising, Wanda strives to make us understand what living under occupation was like, and her vengeful passion to strike back against the terror inflicted on her city and the massacre of innocent civilians. At only 17, Wanda took up arms alongside the Home Army to fight the Germans face-to-face, in her words, "to see who is better, faster, braver, and who has fortune on their side". Through this powerful personal testimony, the film guides us through the story of Warsaw's fight for freedom, touching upon the strain of Allied politics and the impending Soviet cruelty to be unleashed upon Poland after the end of their resistance. These bonds between nations during the war stand in stark distinction to the lasting ties of brotherhood found within the military units of the resistance force, a union that "you must live through to understand what it really means", as Wanda says. Yet the film is ultimately a testament to the unrelenting courage of both soldiers and citizens. "Heroism is to be afraid, afraid like the civilian population was": Seventy years on Wanda's memories remain as vivid as ever. 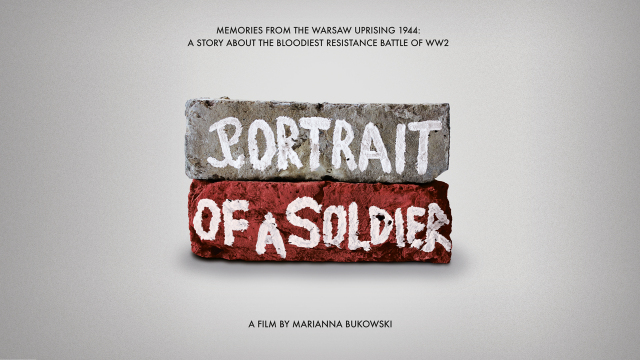 Marianna Bukowski is the director, producer and editor of Portrait of a Soldier. 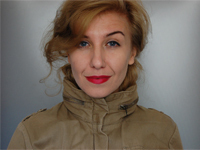 Marianna Bukowski works across both advertising and factual documentaries. She is an award-winning creative behind many notable promotion and brand campaigns for Channel4 and Sky. Her factual programme credits include Associate Producing Heroes of War: Poland, A WW2 Series made for History UK in 2013 and broadcast in 40+ countries worldwide.Portrait of a Soldier is her first independent documentary as director, producer and editor. Director Marianna Bukowski first met Wanda Traczyk-Stawska in 2004, and in 2008 decided to make Wandas story into a documentary film. 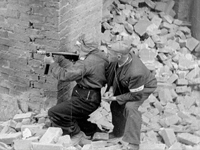 The idea was to build a story of the Warsaw Uprising through one individual perspective  creating a personal narrative that would be of interest to audiences both familiar and unfamiliar with the Uprising. Filmed over several years, the different interviews with Wanda, have allowed for a personal documentary with a unique insight. The archive material was also meticulously sourced: the film contains a vast collection of photographs, of both soldiers and civilians - as well as rare footage filmed during the Warsaw Uprising.